If you lived in Phoenix in the 1970s and '80s, you remember the Lou Grubb commercials. 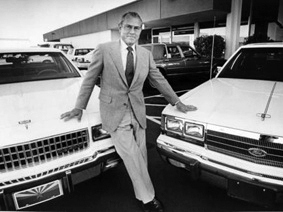 Lou Grubb had a Chevrolet dealership, and mostly I remember his radio commercials, which were so low-key that sounded more like he was trying to lull you to sleep rather than talk you into buying a car. The commercials started with some very soft music. And since I was young, listening to rock-and-roll, the music sounded VERY soft. 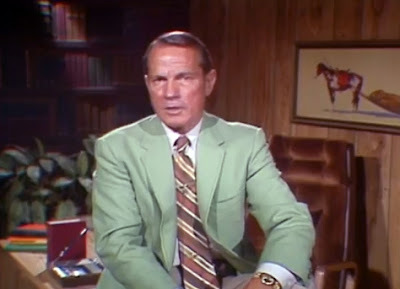 The announcer would introduce Lou Grubb, who would sound kind'a like your slightly-sleepy uncle who just happened to wander into your living room and decided to talk about whatever was on his mind. I was new to Phoenix, and his commercials puzzled me. What was he selling? At the end of the commercial, the announcer would say the words "Lou Grubb Chevrolet", so it must have gotten through to me. Off the top of my head, I can't remember any other Chevrolet dealerships, so his commercials must have been effective. In the early 1980s I was studying Marketing, Advertising, and Graphic Design at ASU. And ultimately I went into a field that is known as image advertising. That is, low-key, no hard sell, just showing that a company is in business, and has a product at a reasonable price that you may be interested in. And I have to admit that I was very much influenced by Lou Grubb. My understanding, from talking to people who knew him personally, was that Lou was the same in real life as he was on his commercials. I call this type of advertising "showing customers who you really are". And yes, there are copywriters creating the exact phrasing, but these are the words that a reputable company speaks. I'm sure that if you Google it, you can find videos of Lou Grubb commercials. And they look like absolutely nothing today. It was just him, sitting there, talking into the camera, the same way that a lot of people who do YouTube videos are doing today. But at the time it was amazing, because the other commercials were annoying, screaming, and shouting. Lou spoke softly. I can still hear his voice.